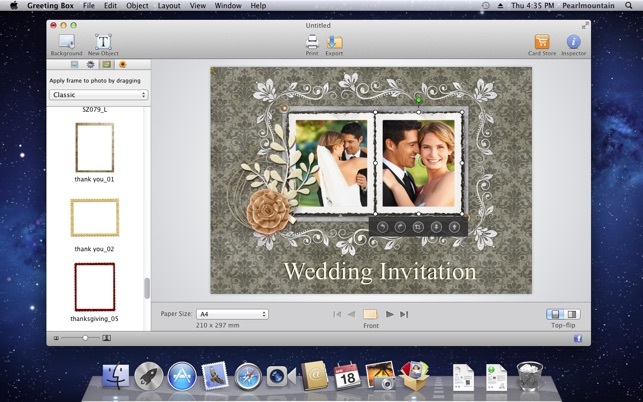 Greeting Box is an easy to use and powerful app to create personalized greeting cards for any occasions and holidays in a more convenient and fun way on Mac OS X. You can add your photos in a card and customize the card as you wish. With Greeting Box, it’s easy to send personalized warm wishes to your loved ones and better keep in touch with acquaintances and friends. Greeting Box comes with 110+ delicate templates and numerous art resources for any occasions and holidays such as Birthday, Wedding, Anniversary, Baby Shower, Christmas, Thanksgiving, etc. 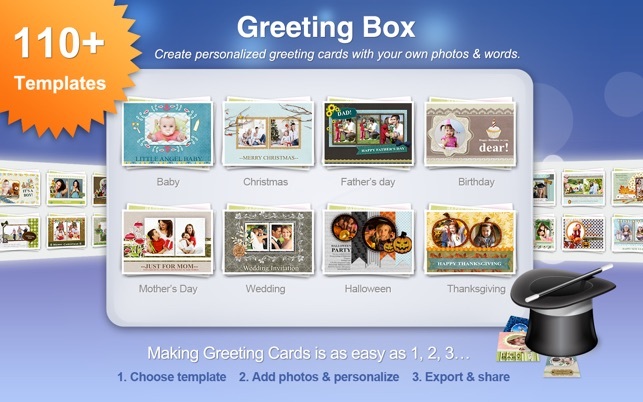 Using Greeting Box is as easy as 1-2-3. Simply select a template; add your photos, text, clipart, background, and other elements you want; print, email or share your card. 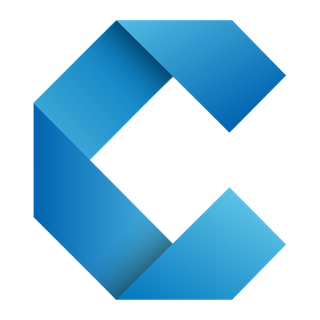 "I was amazed to find this well designed, so easy to use - it can do the card orientations, vary the transparency and layer images and overlap - and add text. Does what it says - fun to use!" * Create Birthday cards for your bosom friends to enhance your friendship. * Add a love poem to your card to convey your adoration to the special one. * Add family photos to make a unique card for your families on Christmas. * Write thanks and wishes to your friends on Thanksgiving Day cards as special gifts. Step 1: Choose a template to start your work. 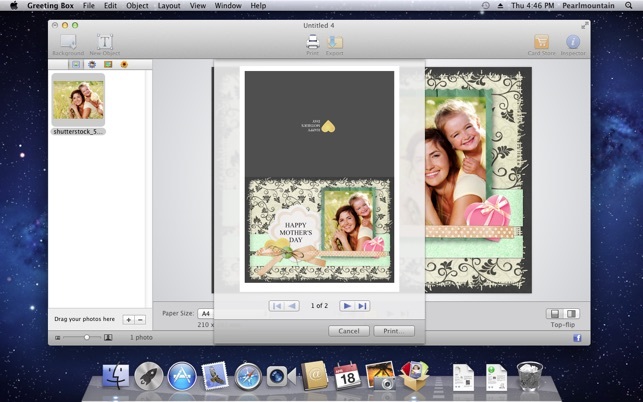 Step 2: Import photos and personalize your greeting card. Step 3: Print and share your greeting card. • Easy enough to personalize greeting card with intuitive interface. • Lots of art resources and design features to help you customize the card perfectly. • 110+ templates and numerous art resources. 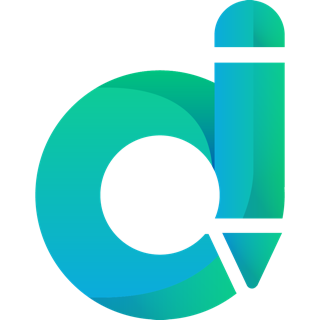 • Diverse templates help you fully extend your creativity. • Templates are suitable for any occasions and holidays such as Birthday, Graduation, Wedding, Christmas, Thanksgiving, etc. 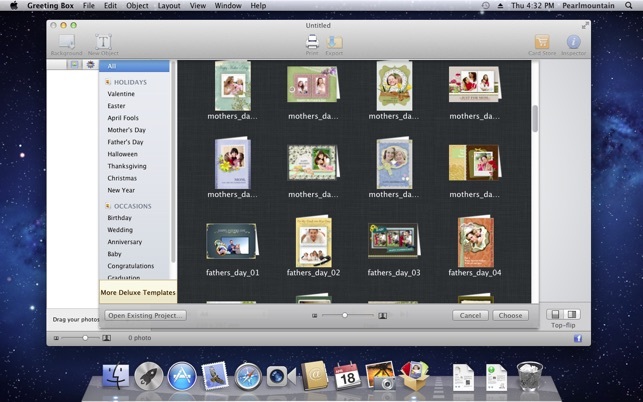 • Drag and drop your photos into greeting card easily. 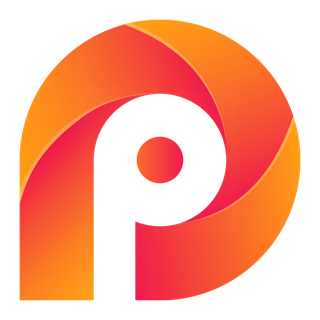 • Move, rotate, and resize photos with a few mouse clicks. • Cropping makes photos fit well in the chosen frame. 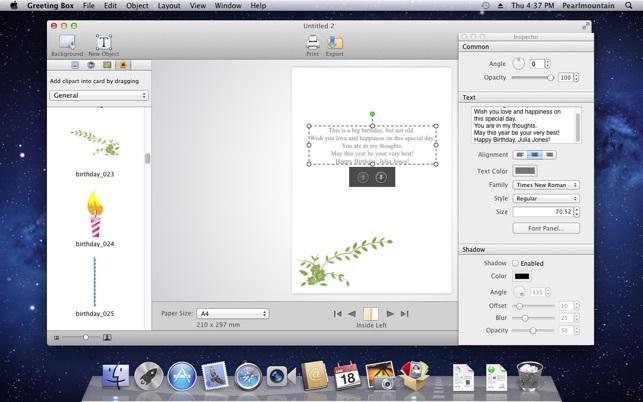 • Add text and input your own words. Edit text by applying shadow, adjusting font, size, color, angle, etc. • Various background patterns produce good looking cards. • Different frames, masks, clipart help you create special artistic effects. • Make greeting card looks even better by adjusting size and position of embellishments. • Save greeting card as image formats. • Share greeting card with your friends and families via Email. • Print greeting card directly in half-fold.